Excerpts from todays early morning report coming out of #StandingRock. ‘….Over 300 police officers in riot gear, 8 ATVs, 5 armored vehicles, 2 helicopters, and numerous military-grade humvees showed up north of the newly formed frontline camp just east of Highway 1806. In addition to pepper spray and percussion grenades, shotguns were fired into the crowd with less lethal ammunition and a sound cannon was used (see images below). At least one person was tased and the barbed hook lodged in his face, just outside his eye. Another was hit in the face by a rubber bullet. A prayer circle of elders, including several women, was interrupted and all were arrested for standing peacefully on the public road. A tipi was erected in the road and was recklessly dismantled, despite promises from law enforcement that they would merely mark the tipi with a yellow ribbon and ask its owners to retrieve it. 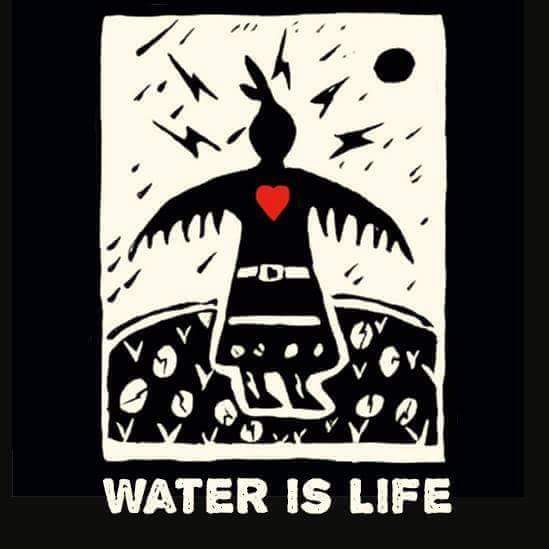 A group of water protectors was also dragged out of a ceremony in a sweat lodge erected in the path of the pipeline, wearing minimal clothing, thrown to the ground, and arrested. Two medics giving aid at the front line were hit with batons and thrown off the car they were sitting on. Then police grabbed another medic, who was driving the car, out of the driver side while it was still in motion. Another water protector had to jump into the car to stop it from hitting other people. Members of the horse nation herded around 100 buffalo from the west and southwest of the Cannonball Ranch onto the the DAPL easement. One rider was reportedly hit with up to four rubber bullets his horse was reported to be hit in the legs by live rounds. Another horse was shot and did not survive.